Remember the good old days when we were kids and wrote with ink? If we worked really hard and got a good grade, our math test was brightened up with a nice little stamp. The second time, we’d get a picture. And with the third straight A, we were in for a treat: we were allowed to write with colored ink. Now, what does this example show us? Simple: gamification works, regardless of your age or the era you live in. And here’s what’s interesting: you can deploy it to motivate your sales team. How? By using Visual Management. Visual Management: it’s all in the game! Let’s elaborate on the ‘color rewards’ from our example. If you want to show people what is and isn’t working at a glance, color-coded digital communication screens are the way to go – especially if you need to inform a lot of employees of the current state of affairs in real time. One of our clients, a typical service organization, has dozens of sales team members who need to meet certain targets. 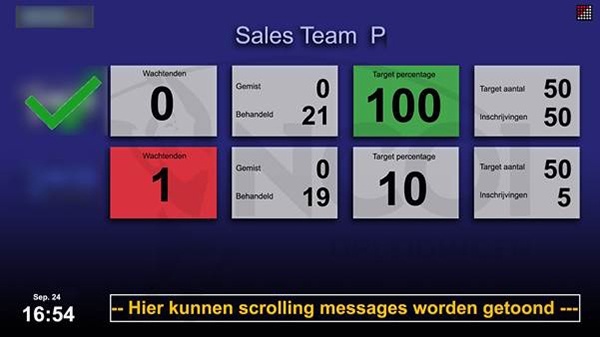 With the help of Texas Digital, this company has visualized all sales targets in the form of small, colored blocks. If a sales group’s block is red, it’s lagging behind; if it’s green, the group has achieved its goals. Such screens are called heat maps – they help employees adjust immediately where necessary, and they visualize successes. This is, of course, a way of gamifying the tasks salespeople need to complete as part of their job. Since they operate in a completely different field than customer service employees, and they’re often dealing with a competitive type of pressure, heat maps can greatly motivate them. At our client’s company, gamification has been a surefire way to keep up with the sales targets that need to be met! Want to motivate your sales team? Want to discover how gamification and Visual Management can help your sales team thrive? Please don’t hesitate to contact us. We’d be happy to perform a Quick Scan and discuss your Visual Management opportunities.